This one was beautiful — there was an abundance of brilliant sunshine, B2 got to see all his closest friends from undergrad, I got really weepy during the exchange of vows despite having met the groom for the very first time about 12 minutes before the ceremony. I learned what a New Orleans second line is (and that it is more challenging than I would have thought to wave a cloth napkin to a beat?!) Also, there were these really excellent mini chicken quesadilla cone-things at the cocktail hour, half of which were consumed by me, and the most delicious vanilla cake with raspberry frosting. Do not invite me to your wedding, I will eat all your food. So that was our weekend! We spent the flight back talking about all the things we wanted at our own wedding, and we got back on Sunday with enough time to bake a batch of cookies and enjoy a little bit of gorgeous New York spring, not quite as warm as sunny Carolina but still amazing. My only regret: that we didn’t make it to a Cookout or Waffle House before we left. Next time. With the exception of this weekend and a few days here and there, spring has been coy in New York. The finicky weather has me waffling between staying close to comforting things that bake in a toasty oven and moving on to crisp, fresh spring greens. This pillowy focaccia, warm from the oven but studded with spring herbs, was my way of compromising. A good focaccia has been on my to-do list for awhile now. 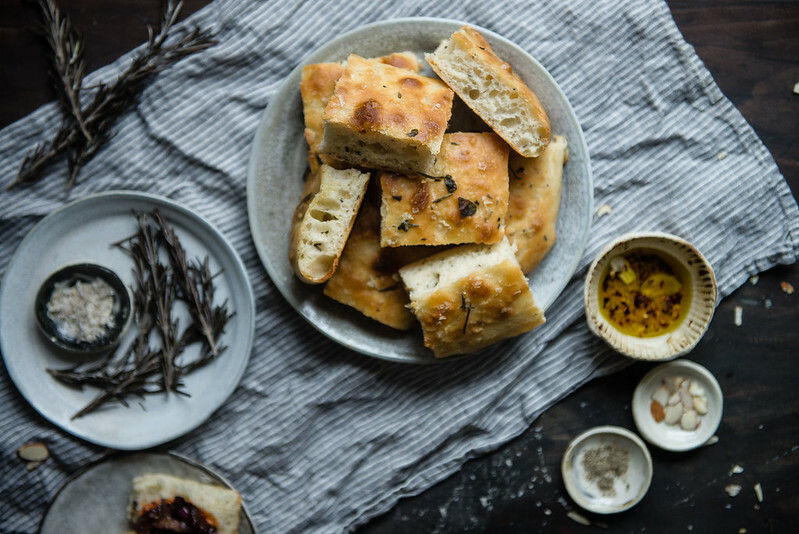 I think there’s something irresistible about a salty, flavorful, crackly-topped focaccia with pockets of grassy olive oil and generous flecks of rosemary, dipped in a good sauce or all on its own. Of the recipes I tried, this one by Sam at Love Comma Cake was my favorite, scaled it down just slightly for a 9×13 pan and with an overnight rise thrown in. 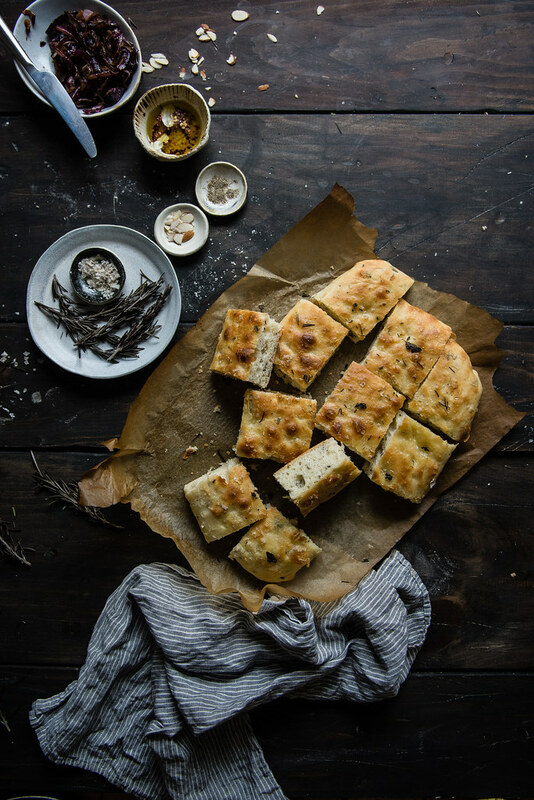 It was everything I wanted from focaccia — crisp and golden on top, light and soft inside but still satisfyingly chewy, with plenty of little divots for olive oil and herby goodness. The focaccia was more than good enough to devour plain, but I paired it with what might be my new favorite sauce: Molly’s romesco! I’d never had romesco before this but oh my gosh, I’m in love. Tart from a splash of vinegar, subtly sweet and smoky from roasted peppers, and hearty from toasted nuts, it has all the piquancy and depth of flavor I didn’t know I was missing in a tomato-based sauce. I want it on everything. Served with jammy caramelized onions on top, this made for the perfect lunch for us to bridge the gap between a blustery late winter and a gentle early spring. Happy Wednesday! 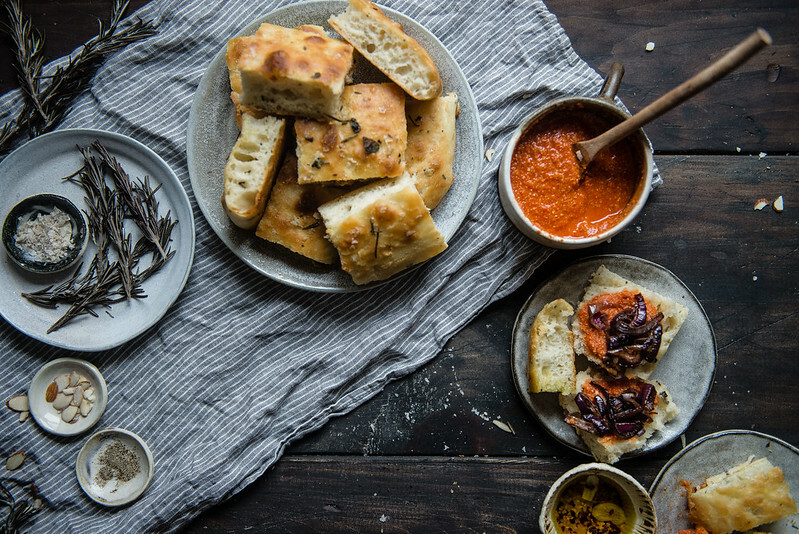 Herbed focaccia & pimento romesco. 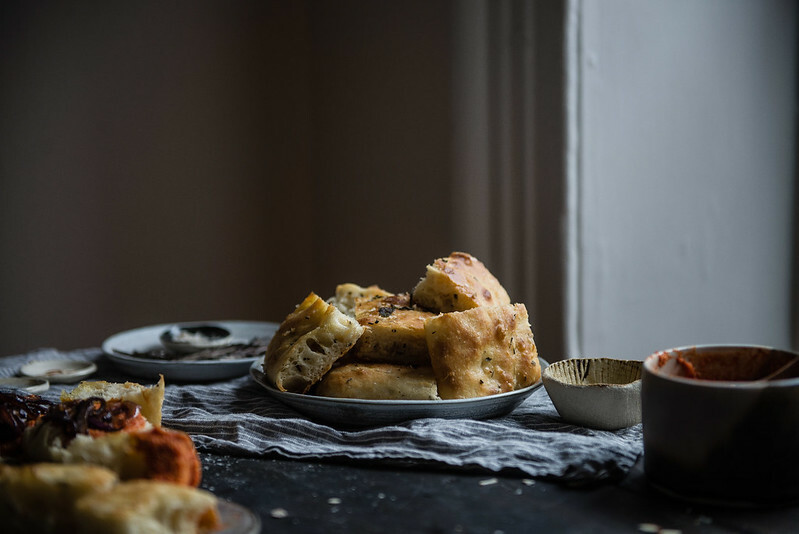 The focaccia is a slightly scaled-down version of this recipe by Love Comma Cake; the romesco is barely adapted from My Name is Yeh. I added roasted pimentos as a nod to my beloved Southern staple and used almonds, just because I like them, but Molly's walnut and roasted bell pepper version sounds fantastic as is. One day ahead: In a large bowl, whisk together the flour, salt, sugar, 2 tablespoons chopped herbs, and yeast. In a small bowl, whisk together warm water and oil. Add the water mixture to the flour mixture and stir with a rubber spatula (these are my favorite) until all the flour is moistened -- the dough should be quite wet and tacky, something like the dough here but should not be soupy. Lightly oil a large bowl or 4-quart container with olive oil. Scrape the focaccia dough into the bowl and gently turn to coat. Cover tightly with plastic wrap and place in the refrigerator to rise overnight, 8-12 hours. For the romesco: At this point, you can also make your romesco (and your caramelized onions, instructions here and here). For the romesco sauce, simply combine all the romesco ingredients in a food processor or blender and puree until smooth. Adjust seasonings to taste, and that's it! Romesco will keep up to 3 days. Day of: When you're ready to bake, oil a 9x13-inch rimmed baking sheet or baking dish. Transfer the dough from the bowl to the baking sheet. Using your hands, flatten the dough and fold it in on itself once or twice, then gently press and stretch it into a large rectangle. Don’t worry too much about getting it to cover the pan initially. Place the dough in a warm place and let it rise for 10-20 minutes, or until it begins to feel soft again. At this point, you can gently stretch it to cover the entire dish. Preheat the oven to 450° F. While it’s preheating, let the dough rise for another 20-30 minutes, or until it comes to room temperature. Using the pads of your fingers, press on the dough all across its surface, patting it down to about 1/2 or 3/4-inch thickness and creating dimples evenly across the entire surface. 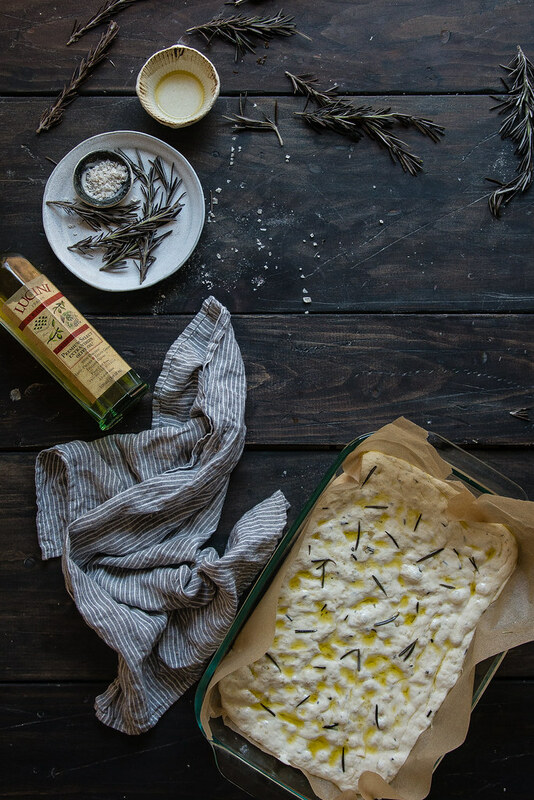 Marian compares it to “playing chords on a piano.” Whisk together remaining 2 tablespoons herbs and 2 tablespoons olive oil, then drizzle evenly across the dough. Bake until golden brown, puffed, and set, about 20 to 25 minutes. Transfer to a wire rack to cool, then remove from the pan, slice, and serve. Enjoy warm, with romesco sauce for dipping and caramelized onions to top. Happy spring to you too dear Kathryn!!! Thank you so much for your sweet words as always!! Oh my gosh, it sounds HEAVENLY over grilled leeks! I need to try that next (instead of carby-carbs all time, lol!) Thank you so much for stopping by, Kate! Oh my god. Focaccia holds a really special place in my heart. I remember distinctly how focaccia saved my life (ok, I’m being dramatic), but Alex and I were traveling from Rome to Paris via a long long train ride. We were rushing to the station and didn’t exactly have time to stop at a restaurant and eat a sit-down meal. So we stopped by a beautiful bakery and ordered two types of focaccia to go. The first bite into the fragrant, mushroom focaccia gave me back my sanity, I swear… So happy you had a great weekend. Aren’t weddings fun? 🙂 I’ve been to so many as a wedding photographer but I still find them magical and full of love and fun. Especially when people start dancing like crazy :). Ha, I love that story! I believe focaccia has life-saving powers for sure. 🙂 And I can only imagine how fun and rewarding being a wedding photographer is!! It does sound magical for sure! OMG HIGH FIVE! Hahaha. The vows get me every. time. If you can believe it, I’ve never made foccacia! I really need to remedy this! I am the same way, almost anything wedding related at this point makes me weepy and feel allll the feelings. Wowwww that focaccia! And, I definitely salute you as you go into wedding prep mode. I’m a bridesmaid right now for a dear friend who is throwing a fairly huge wedding, and it’s both a joy and sometimes a cautionary tale regarding planning! Know you have an army of readers who have great recommendations! okay, onto the food: I’m obsessed with the addition of romesco and can only imagine how perfectly it pairs with focaccia. All of that herby, crunchy goodness sopped up with the bright red sauce and olive oil…uhhh can I have that for breakfast? Or would that be weird? This looks so good! I haven’t made homemade bread in a while, and this will finally end the drought. Great pictures and I love the sauce idea. So smart! What a lovely focaccia but that romanesco is really the one that makes this stand out! Weddings always feel so special. I attended two weddings + two bachelorette parties last summer but this summer will be wedding-less. Definitely going to miss all that love, fun, and good food (+booze). So much for fancy names….this is simply gorgeous! I haven’t been to a Waffle House in years! That used to be one of my favorite road trip stops. I’m glad the wedding was lovely and I’m glad to see this gorgeous foccacia in my feed. Just beautiful. I love so many things about this. You were in Carolina!!! And Cookout.. I mean those hushuppies!! And yes to crying at weddings. I’ve been on this bread baking kick so I have to try this. That weekend sounds amaze. I’m totally with you on the weepies (in fact, there may have been a couple times I’ve teared up after a commercial or two). Totally latched on to and spent a little too much time on youtube watching it. I’m kind of mesmerized. Same can be said about this focaccia. WOW. Nailed it. And that romesco sauce. But really, those caramelized onions are totally speaking to me. This is just amaze. All of it. Thanks for the foccacia love! Don’t you just want to snuggle up to that dough? I can’t wait to try Molly’s romesco. What a great combo. Oh, cool, Cynthia. I’ve just eaten Romesco sauce in Spain and looking forward to pound this delicious sauce at home (though had to restrain myself from getting another pestle and mortar and lugging it onto the plane), great that you’ve just provided a recipe for this one! 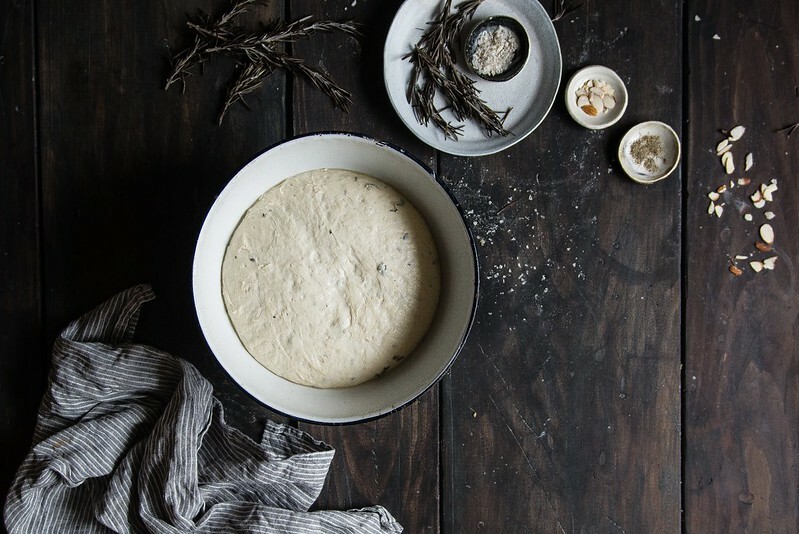 I love that this dough can be prepped and made ahead the night before. Will be trying this recipe for sure. Thanks Cynthia! Awww glad you had such a great time, girlie!!! And I totally high five you in the “I will eat all your wedding food” comment. I know we should probably be a bit more self restrained, elegant, blaah blah but I just can’t because I love wedding food! 😀 haha. I also love focaccia bread for sandwiches and I don’t think I’ve ever tried romesco before but it sounds like my type of sauce–tangy and spicy. I just want a pillow of the foccacia so I can stay in bed all day and eat it! 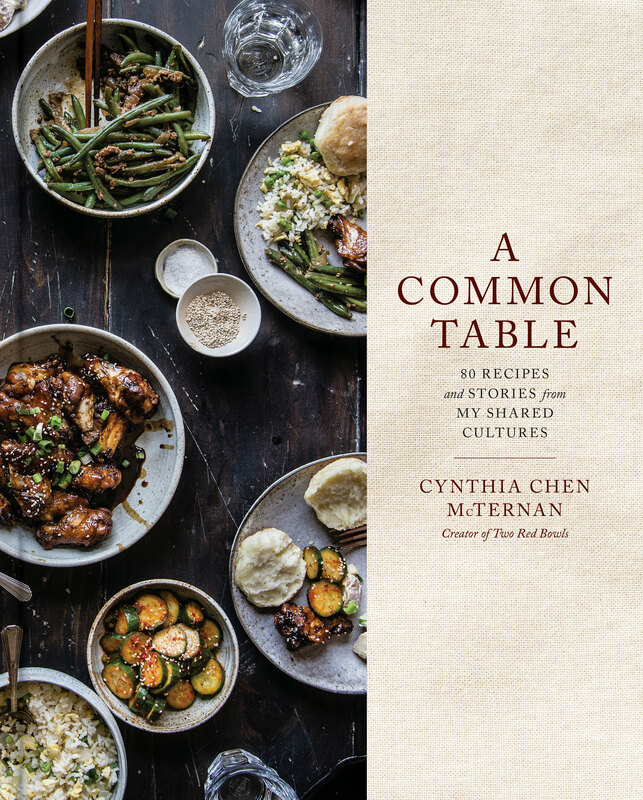 It looks so lovely, and I really love the romesco and caramelized onions you added with it – that’s such a fantastic idea!! heehee i cry all the time at ppl in love 🙂 i don’t even need to know them…and um, yes to eating all the things at weddings…. this focaccia is awesome! i really need to up my bread game – you inspire me! Oh goodness this looks absolutely amazing! The perfect compromise between spring and winter food! 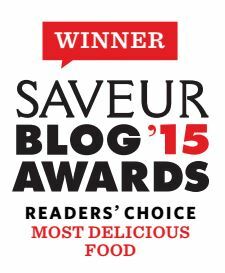 I’ve never tried romesco before either but after reading this I think I need to really soon. I love focaccia and I know I would just devour this! Love! Oh my, I am the same exact way about weddings. They make my heart all weepy and full of light and I’m so glad I’m not the only one who could spend hours watching wedding highlights. Although, I’d much rather be AT the wedding because, um, cake?? But this focaccia! This is some of the softest looking focaccia I have ever seen. And that romesco sauce truly does sound amazing. looks outstanding. I’ve never had romesco, but am intrigued at its’ clever use of almonds. Will definitely have to try making both of these! Amen! I don’t even know what I’d do if I saw an engagement happen IN REAL LIFE. 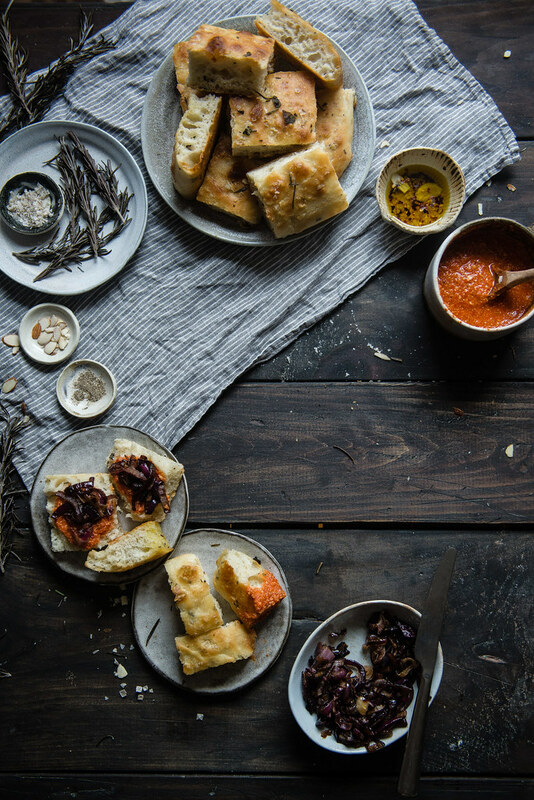 This springy focaccia and that romesco sauce are everything I want right now. I bet if you offered to bring a loaf (is this what you call it?) 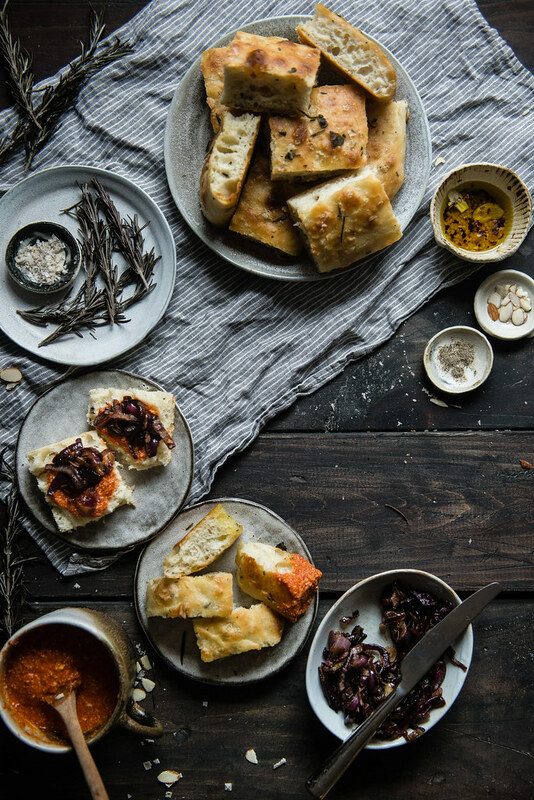 of focaccia in exchange for eating all of the food, you’d be the #1 guest. Focaccia has got to be one of my favorite breads. I love this recipe!! This Focaccia looks delicious – a fluffy center and crispy edges. Ahhhhh this looks delicious! I haven’t made focaccia since I attempted it once like seven years ago, and ended up with the equivalent of salty styrofoam. (I was dating the Italian guy at that time too. He tasted it and looked at me like I’d disgraced his heritage.) There’s this amazing bakeshop in the next town over, and I bought a slice of focaccia from them a while ago that was so salty and topped with onions, smoked salmon, and dill (and the smoked salmon had crisped up from being baked). There might have been bits of feta or goat cheese in there too I think; I can’t remember because I stuffed it in my face in like 5 seconds flat. It was INSANE. I love romesco sauce too. Funny because with all the cooking that I do, I have never had it up until very recently myself. 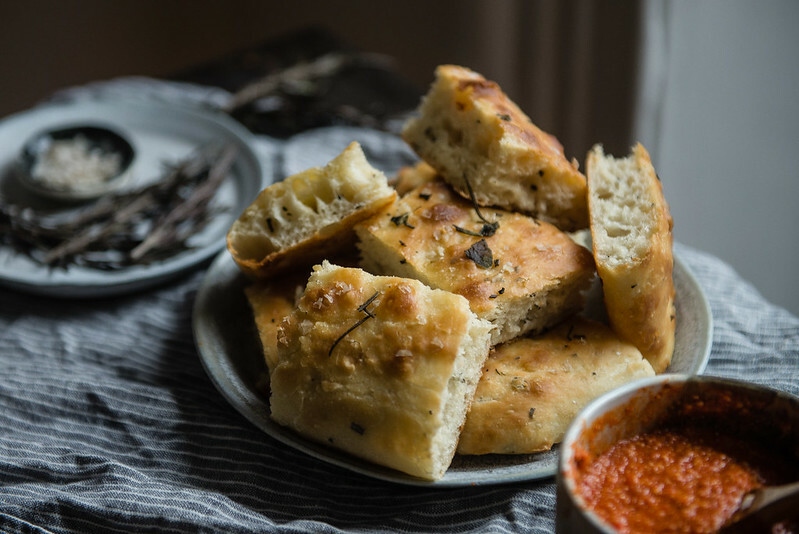 I can only imagine how delicious this focaccia bread must taste with homemade romesco sauce. So beautifully photographed, as usual. Cynthia! I love that this comment thread has turned into a giant crying confessional—exactly what every blog post should aspire to be. I, too, am a total wedding weeper. So much so that if I don’t cry at a wedding, I become deeply unsettled and am certain there may be something wrong with the marriage (shhh don’t tell anyone I said that!). AND THIS FOCACCIA. I think I said this on Insta, but I am just obsessed with focaccia, and actually had a period in my teenage years where I was constantly baking it, using whatever herbs I could forage from our garden. I miss that! Not to mention that my favorite sandwich in the whole wide world is on two herby slabs of focaccia bread. I may need to remedy the serious dearth of focaccia in my life of late with this geniusness. Thanks for being such an inspiration, Cynthia! That focaccia looks like a perfect soft pillow. Nice work! Might make this delicious combo this weekend.